A Turkish cargo plane flying from Hong Kong has crashed into a village in Kyrgyzstan, killing all four crew and at least 33 people on the ground. 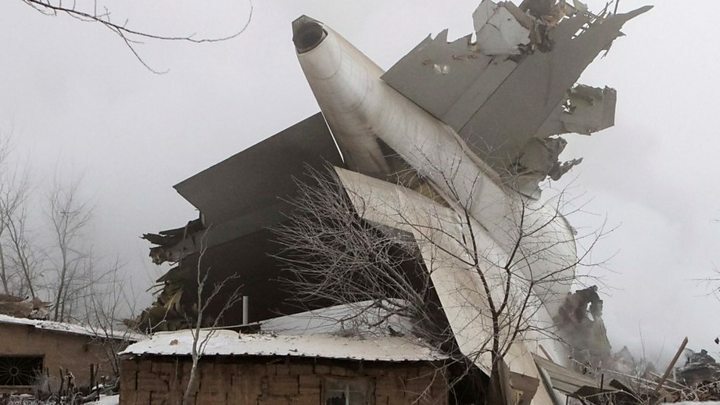 The Boeing 747 operated by ACT Airlines crashed as it was about to land in fog at Manas airport, 25km (15 miles) north of the capital, Bishkek. At least 15 buildings were destroyed in the village outside the airport, with a number of children among the dead. Kyrgyz authorities have declared a day of mourning for Tuesday. Deputy PM Muhammetkaly Abulgaziev said on state TV: "According to preliminary information, the plane crashed due to a pilot error." One witness, Baktygul Kurbatova, told local media: "I woke up because of a bright red light outside. I couldn't understand what was happening. "It turns out the ceiling and the walls were crashing in on us. I was so scared but I managed to cover my son's face with my hands so that debris would not fall on him." 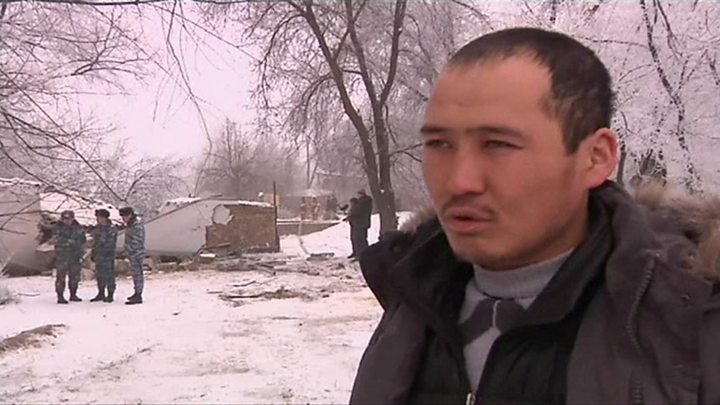 Media captionUson, eyewitness: "We saw a bright light...then we realised a plane had crashed"
Another resident, named only as Tajikan, said she heard "a roar and (what felt) like an earthquake". "Many people were sleeping, everything around was burning. One of the parts of the aircraft fell on our neighbour's house. She and her whole family died." At least 15 people, including six children, were injured, the health ministry said. ACT said the plane had no record of technical faults and had not encountered problems during its flight. One of its two flight recorders has been recovered, the Kyrgyz prime minister's office said. Turkish President Recep Tayyip Erdogan called his Kyrgyz counterpart, Almazbek Atambayev, on Monday to express his sadness at the loss of life. Image caption One witness told AFP news agency: "The plane crashed into the houses. It killed entire families. There's nothing left of the houses. Many people were sleeping"